Some children don't grow as tall or as fast as others. Their growth is stunted. 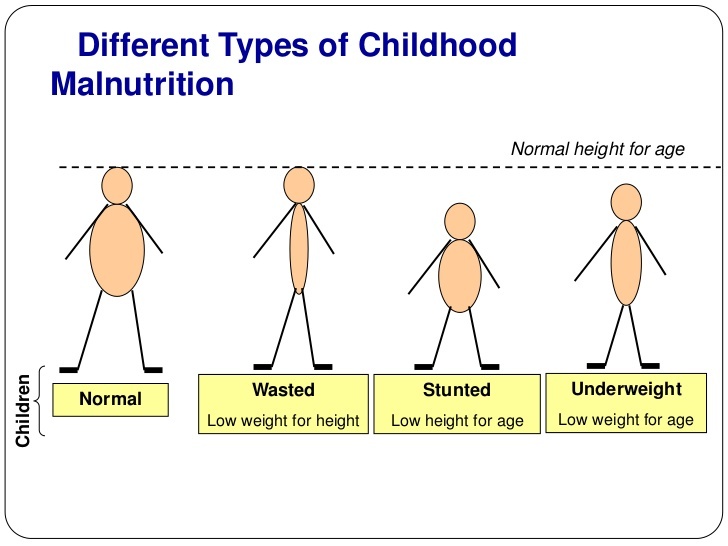 Stunting not only causes a lack of height, but more importantly, it can cause major short and long term effects on children. This include poor performance in school, reduced lean body mass and diminished intellectual functioning. Our body needs many different types of nutrients taken from different foods in order to grow optimally and function properly. Children who are picky eaters run the risk of consuming insufficient nutrients. Children's ability to eat normally is also affected by certain chronic conditions they suffer from. For example, a child with heart disease may experience rapid breathing, which causes them to use up a lot more calories. Therefore they need to consume more calories than normal healthy children to keep up with their body's demands. poor preparation and cooking practices which destroy the nutrients. 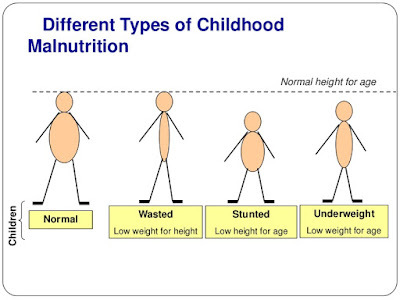 The lack of nutrients weakens the child's immune system and can lead to recurrent infections (e.g. pneumonia, hepatitis, influenza), which expose them to the risk of cognitive impairment and stunting. Diseases like scleroderma and celiac disease slow bowel movement, which causes bacterial concentration in the gut. GERD (gastro-oesophageal reflux disease) can cause frequent vomiting and indigestion. Diarrhoea can be caused by bacterial/viral infections or inflammation of the gut (e.g. ulcerative colitis and Crohn's disease). All these can lead to nutrient loss when the child goes to the toilet too often or their intestines are unable to fully absorb the nutrients, which in turn cause weight loss, poor weight gain, poor growth and abdominal pain. Children who suffer from a hormone deficiency may be unable to efficiently use all the nutrients they consume. Children with hypothyroidism may experience poor growth, delayed development of permanent teeth, delayed puberty and poor mental development. Feed the child with a healthy diet, which is moderately portioned with different varieties of food types, texture and colours. Supplement with Yung Kien Pollen, as it contains more than 200 types of nutrients, including more than 16 types of vitamins, 16 types of minerals and 94 types of enzymes and coenzymes. Bee Pollen is 100% natural and wholesome and is nature's most complete food after mother's milk. Include fiber in the child's diet everyday as fiber helps improve digestive health and promotes gut flora balance. Supplement with Jia Hor Fiber, as it not only contains non soluble and soluble fiber, it also contains Lingzhi, which does an excellent job to regulate the body's overall wellbeing. Avoid giving the child antibiotics as it kills both bad and good bacteria. Good bacteria is needed for gut and overall health as the gut houses about 80% of our body's immune cells. 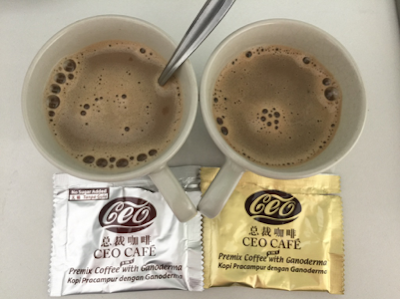 Supplement with Lactoberry probiotics, as it not only encourages the growth of good bacteria, it also helps prevent allergy problem and improve their immune system. Please email me at askfuiping@gmail.com to purchase. I am an Authorised Distributor. All our products are very safe for children consumption.